Jewelry of all kinds – from fancy to simple – really attracts shoppers' attention when presented on a background that accentuates its artful form and design. Burlap displays are excellent choices for this since their natural, homespun appearance serves to highlight rather than detract from the product. As a rustic material once associated only with potato sacks and other humble objects, burlap has really come into its own as a popular ingredient in fashion merchandising. It's a hip and happening fabric that offers both beauty and practicality to savvy jewelry vendors everywhere. Many beige, brown or unbleached burlap fabrics are neutral in nature, so they are a perfect complement to nearly any color scheme, from subtle, traditional gold and silver to vibrant, innovative designs blending traditional metals with bright insets of colorful jewels, appliques or other materials. These days, burlap is not only trendy, but it's also earth-friendly. Ecologically-minded shoppers will be able to see at a glance that you share their tastes, values and sensitivity. Burlap fabrics are ideal for theme merchandising concepts like beach and barn, shabby chic, vintage, woodsy, old-fashioned country and other warm, homey settings. Whether the jewelry you're displaying is traditional in nature or more bold and trend-setting, burlap has an amazing ability to adapt to any style or design. From glamour to grunge, burlap backgrounds handle it all. Because of its rough, coarse weave, burlap doesn't show fingerprints and smudges, compared to other materials. Also, the texture serves as a great disguise, so pin holes from jewelry pins are barely noticeable. Best of all, the fabric itself is relatively wrinkle-free, inexpensive and easy to maintain. Both jewelry artisans and stores, large and small, appreciate burlap's incredible practicality and flexibility. 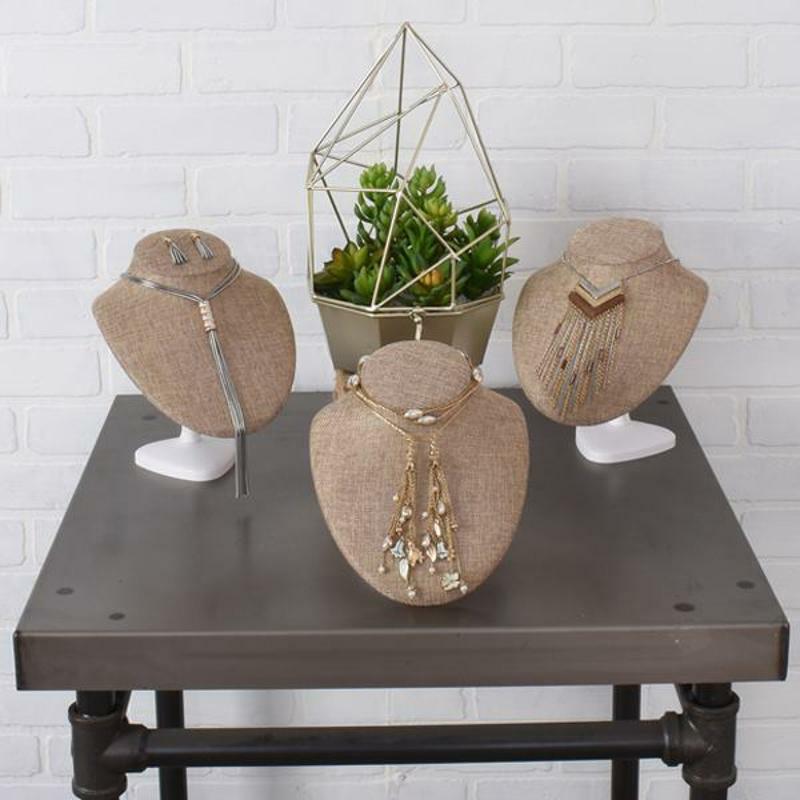 Burlap jewelry displays are available in a wide variety of store fixtures and forms. These include stylized necklace busts in different sizes and shapes, which are wonderful for showing off long chains and large pendants; T-bars for displaying bracelets and watches; necklace easels; burlap pads and shapes; jewelry cases and trays; ring displays; earring trees and stands as well as creative tiered display bars. Burlap lends a sense of depth and clarity to whatever merchandise is being displayed. The artisan's exquisite craftsmanship really comes to the forefront, encouraging customers to focus on the fine detailing and the subtle nuances of color and shape, as well as the dramatic flair present in each piece. Last but not least, burlap fabric is simple, uncomplicated, humble and extremely down to earth. 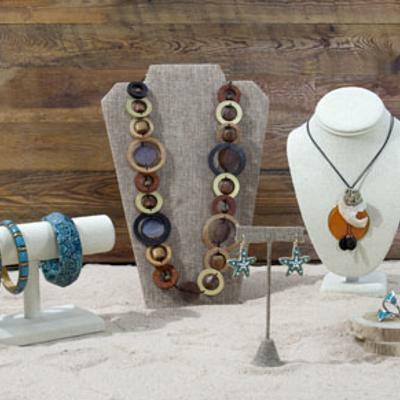 If jewelry design could be compared to musical composition, an unpretentious burlap background is the perfect counterpoint to the orchestrated elegance of jewelry creations.